A group Project for Johanna Mendelson-Forman's Spring 2017 Course: "Food Security: Who's in Charge?" Myanmar, the largest country in Southeast Asia, is rich in natural resources and human capital, but it is both food-insecure and underdeveloped because of decades of poor governance. Its recent transition to democracy following nearly 55 years of military control has turned the tide toward better availability and access to food for the Burmese, but many barriers remain—among them, a long, complicated history of ethnic strife, policies that limit land tenure and prevent the largely rural population from farming productively, inadequate infrastructure and irrigation, and susceptibility to natural disasters. 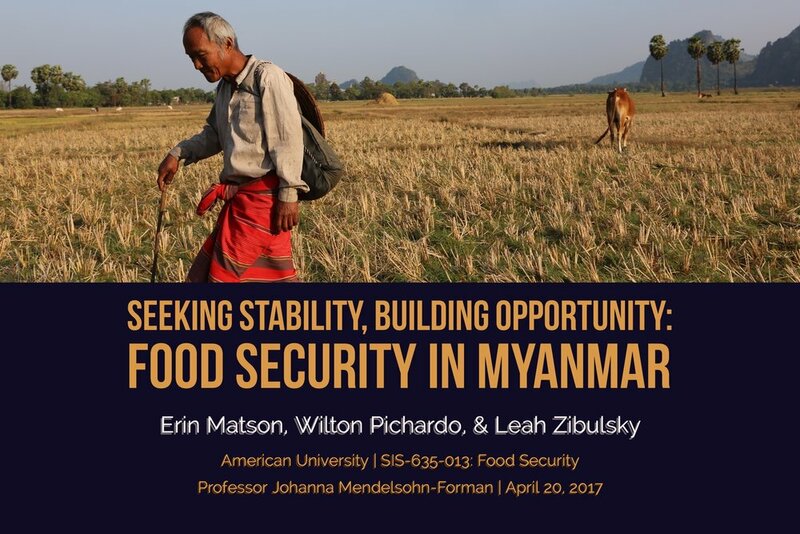 This project examines the current status of food security in Myanmar, what strategies are being outlined and implemented to improve it and by whom, and the likelihood of future food security with a plan of how that may be achieved.